This four-bedroom loft in Park Avenue South Tower, a 1920’s Art Deco industrial building that was converted to co-op loft apartments in 1980, just hit the market for a cool $3,100,000. 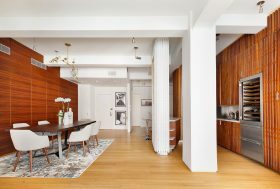 The beautifully renovated corner unit boasts eleven large windows, beamed ceilings, hardwood floors throughout, and custom walnut cabinetry and storage built-ins that bring a mid-century glam vibe to the residence. Left: Rendering of Rose Hill; credit: Pandiscio Green and Recent Spaces. Right: Still from a video by artist Marco Brambilla, commissioned by Rockefeller Group to emphasize the building’s Art Deco influence. Formed over 90 years ago to develop and build Rockefeller Center, developer Rockefeller Group has never built a residential tower in its New York City hometown–until now. Their new condominium tower, Rose Hill has just been unveiled along with the launch of the building’s teaser site. 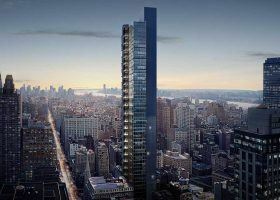 The 600-foot tower is currently under construction at 30 East 29th Street. 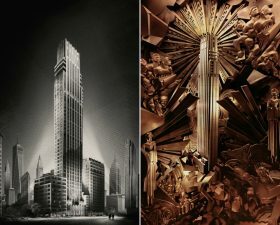 The building will be designed by CetraRuddy; first looks show an Art Deco-inspired facade that does not diverge heavily from the architectural style of Rockefeller Center. 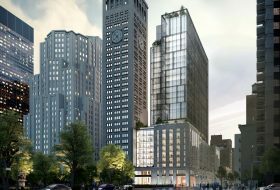 Last December, SL Green announced plans to renovate its building at One Madison Avenue with an 18-floor addition and modern interiors. On Tuesday, CityRealty uncovered a few new renderings of the planned redevelopment, which is being designed by Kohn Pedersen Fox. 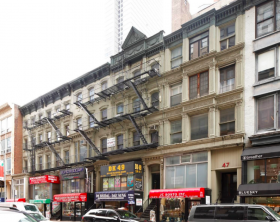 The developer will reduce the 13-story building to its ninth floor and then add the 18 column-free floors above, as well as wraparound and rooftop terraces overlooking Madison Square Park. 6sqft’s series “Where I Work” takes us into the studios, offices, and businesses of New Yorkers across the city. In this installment, we’re going inside innovative design firm ICRAVE’s Nomad studio. Want to see your business featured here? Get in touch! According to the founder of hospitality design firm ICRAVE, Lionel Ohayon, it’s not about the materials used in a project, but the memories created. “I always say, people may hate or like our spaces, but the most important thing is that they remember them,” the Toronto-native told us. Through design, the innovative studio focuses on creating memorable experiences for its clients, a long and varied list that includes the Dallas Cowboys and Memorial Sloan Kettering Cancer Center. 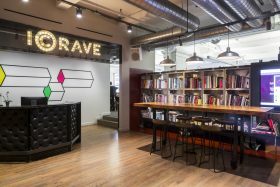 The firm’s mission is ingrained in the culture at ICRAVE, a 40-member team consisting of graphic designers, architects, and public relations pros, an office where creativity is fostered through a mixture of collaboration and independence. The open layout of the studio makes this work culture possible, with custom-designed doors and partitions to transform the space into however necessary. On a recent tour of ICRAVE’s studio near Madison Square Park, Ohayon told 6sqft about the firm’s wide range of projects and how his team turns ideas into unforgettable adventures. The Nomad office tower that neighbors the Met Life Tower is getting a major makeover, SL Green announced Monday. 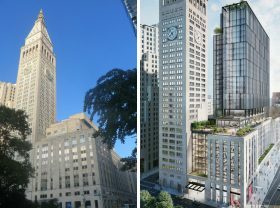 The 13-story building at One Madison Avenue will undergo a redevelopment, including an addition designed by Kohn Pedersen Fox and a modernization of the building’s existing podium. The real estate company said it will reduce the building to its ninth floor and create 18 additional column-free floors above. A rendering released on Monday shows off the planned glassy addition, as well as wraparound and rooftop outdoor terraces that will measure over one acre. 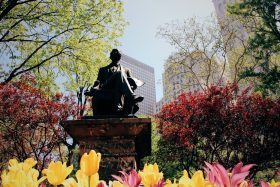 The landmarked Gilsey House at 1200 Broadway was once one of several fashionable Broadway hotels to open after the Civil War, and many of these historic details remain, complemented by the kind of 21st-century updates we expect to find in this once-again fashionable neighborhood. The 1871 Second Empire cast-iron building has become a NYC fixture, known for its three-story mansard roof, and it’s right above this iconic roof that this $3.2 million penthouse is perched. 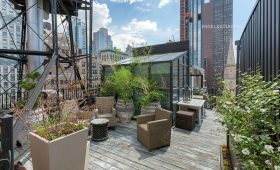 In addition to the landscaped roof deck, complete with a water tower and Empire State Building views, the three-bedroom pad has a sprawling loft layout, two skylights, and a mini solarium. The former Nomad loft of late pop-art artist Roy Lichtenstein is for sale, asking $4.5 million. Lichtenstein, who was a native of New York City, lived at the four-bedroom home at 105 East 29th Street from 1984 to 1988. 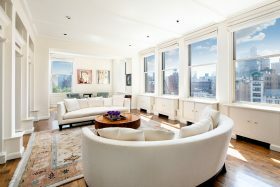 Located on the eighth floor, the sprawling space measures 3,200 square feet and features four exposures from 19 windows. As 6sqft reported last year, Lichtenstein’s son Mitchell listed a home in the Greenwich Village Historic District for $25 million; today it’s back on the market for just under $20 million.